MERRITT ISLAND, Florida - SeaWorld Orlando’s animal rescue team traveled to KARS Park in North Merritt Island, Fla. this morning to return a manatee into the waters near where she was rescued. Claire, a 750-pound manatee, was rescued last June from the Cape Canaveral area due to injuries sustained from a boat hit. Upon her arrival at SeaWorld Orlando just short of one year ago, Claire weighed only 600 pounds. 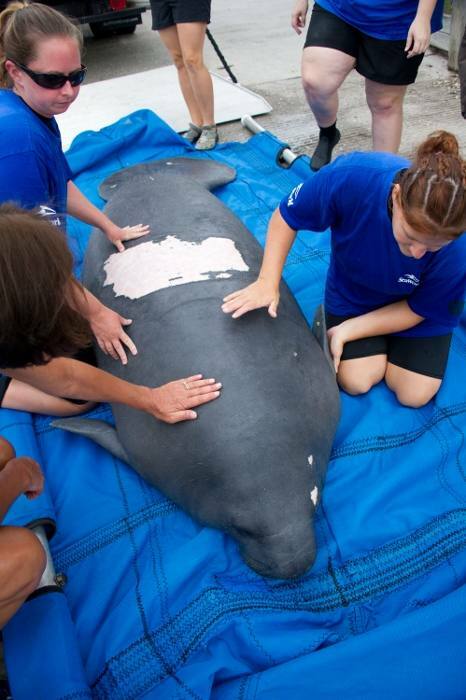 She was rehabilitated from her wounds, and she was closely monitored by SeaWorld animal rescue team until she was cleared for this morning’s return into the Banana River. For 45 years, SeaWorld Parks & Entertainment has helped animals in need -- ill, injured and orphaned. More than 20,000 animals have been rescued by our experts.‪ SeaWorld’s animal rescue team is on call 24 hours a day, 7 days a week. ‪This was the fifth manatee return this year.